Laura Bassen showed us how to make several plaid backgrounds. I loved this. 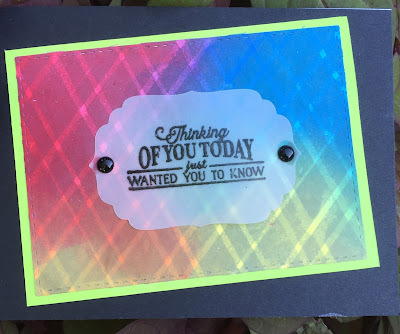 I applied my stripes using Papertrey Inks Distressed Stripes set. I didn't have any really soft grey inks so made do with what I had. After putting my stripes down, I then did some ink blending over the stripes and I really do like how it turned out for a first time try. The Online Card Classes are amazing. You really do learn a lot. Thanks for looking. Great plaid - this class has really been great so far! I love all of the cards you have done!